Okay, so you've made the move to Windows 7, but are you really taking advantage of all the little tricks the OS has to offer? For example, I'm a huge fan of the Windows Explorer icon that has finally taken up permanent residence on the taskbar, as it provides one-click access to my folders, libraries, etc. But did you know that icon has other tricks up its sleeve? 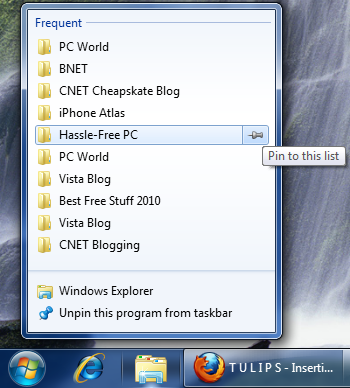 By right-clicking it, you get a pop-up list (or Jump List, to use Windows 7 parlance) of your most frequently accessed folders. Left-click the folder you want and presto: it opens right up. That's much, much faster than any of the old ways of finding your favorite folders. And speaking of favorites, you can easily make any folder a "permanent" part of this Jump List: Just mouse over it and click the little thumb-tack icon that appears on the right edge. Keep in mind that all this listing and pinning makes no changes to the contents or locations of your folders; it's just an easier way to gain entry to them.